Timber material repair and replacement cost for timber bridges is a considerable expense to highway agencies in Iowa, especially to county road departments. To address these needs, the objectives of this investigation was to study the field effectiveness of various treatment alternatives used on Iowa roadway projects and to determine if the current specifications and testing are adequate for providing proper wood preservation. To satisfy the research needs, the project scope involved a literature review, identification of metrics, questionnaire survey of Iowa counties, onsite inspections, and a review of current specifications and testing procedures. 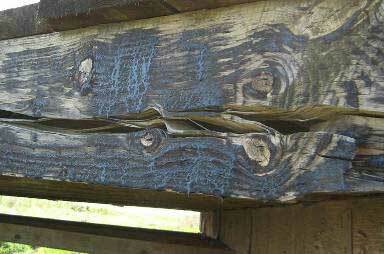 Based on the preservative information obtained, the following general conclusions were made: Copper naphthenate is recommended as the plant-applied preservative treatment for timber bridges. Best Management Practices should be followed to ensure quality treatment of timber materials. Bridge maintenance programs need to be developed and implemented. The Iowa Department of Transportation specifications for preservative treatment are the regulating specification for bridges constructed with state or federal funding in Iowa and are also recommended for all other bridges.